Known as Fall’s Finest Festival, the Fair has been sponsored by the Exchange Club of Rome continuously since its founding in 1949. For seven decades, the Coosa Valley Fair has been sponsored as a service project by the Exchange Club of Rome Georgia. 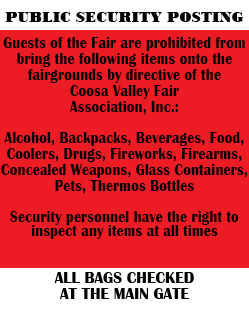 The Fair is actually managed by a separate organization called the Coosa Valley Fair Association. All members of the Rome Exchange Club are voting members of the association, but the day to day management and planning is left in the hands of an elected Coosa Valley Fair Board of Directors. The Coosa Valley Fair is a completely non-profit organization sponsored by the Exchange Club of Rome Georgia. As might be expected, proceeds from the Fair are funneled back through that organization’s projects of service to the community. A primary beneficiary is The Exchange Club Family Resource Center, a family-focused community service agency that provides education and support services to families in Floyd and surrounding counties in order to strengthen the parenting and life skills of the parents and prevent child abuse and neglect within these families. We are proud to be a small part in the spectacular success of that fine organization. Other Exchange Club programs of service run the gambit. See the Rome Exchange Club web site for details. The Fair Association contributes directly to a number of worthwhile organizations. As one example, for a number of years, we have made a contribution to each school in the Floyd County and Rome school systems. These moneys are designated to purchase supplies for each school’s art program. Don’t forget the people who enter personal exhibits ranging from livestock to flowers. In addition to the recognition and the opportunity to showcase their talent, we pay out over $20,000.00 each year in premiums and ribbons. Many organizations and individuals benefit directly by participation in the Fair. As you walk around our midway, notice how many local individuals and organizations are vendors. The local food booths, for example, are all operated by organizations who depend on the Fair to provide a significant part of their annual budgets. Other community organizations gain valuable recognition by building community exhibits. Through our sponsorship program, local businesses are beginning to recognize the benefits which can be derived by association with the Coosa Valley Fair. Perhaps the largest group of beneficiaries of the Fair are the many visitors who pass through our gates each year. We promise to do our best to provide for each of them an unforgettable experience well worth the price of admission.